Gearing up for Thanksgiving, starting with Cranberry sauce with caramelized onions..
Thanksgiving is the time to express our gratitude to our family, friends and everyone out there. The best way to show our love and appreciation to others is by making a scrumptious meal for them, the moment they devour our food, all the silly dislikes and bitterness they carried in their hearts just vanishes and a bridge to peace and contentment sprouts immediately. Obviously, food has the power to bring friends and family together, to heal the hostility we had developed for others in our strenuous attempt to triumph. Thanksgiving is one of my favorite holidays, apart from making the big feast, it gives me a chance to spend quality time with my family and friends. A perfect holiday with black Friday, when I could go little over board and shop crazily. A time when everyone will be seen happy and caring for others. It gives the opportunity to look back and to flip the pages in my life until that day, and to remember those people who had helped me, influenced me, encouraged me, appreciated me and refined me to the person I am today. I simply wouldn’t be what I am today without many. I would like to take this opportunity to express my gratitude to ALMIGHTY, my parents, my siblings, my husband, my family, my friends, my teachers and to each and every person I had met and known over the years. The Thanksgiving dinner or the Thanksgiving feast symbolizes the tradition and custom of the families having the dinner together on the Thanksgiving Day. Dinner is served, generally centered around a large roasted turkey. Turkey, being the main dish for this dinner, Thanksgiving is sometimes colloquially called ‘Turkey day”. Other dishes commonly served are Cranberry sauce, Stuffing, Gravy, Mashed potatoes, Green beans, Bread rolls, and for dessert various Pies are often served: Apple pie, pumpkin pie, sweet potato pie etc. Have a fantastic Thanksgiving everyone! 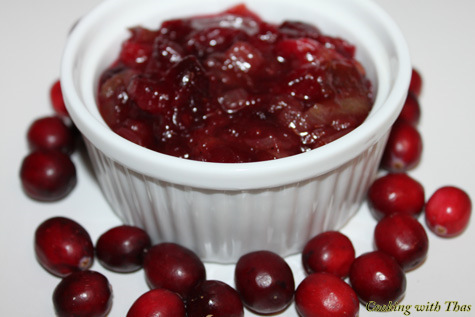 Cranberry sauce with Caramelized Onions: Slow-cooked onions bring extra flavor to this simple sauce and cloves add warmth. I never thought that this simple sauce would taste this good, it had a refreshing taste. I couldn’t resist having this sauce with almost everything I had today, even the sauce itself tasted so good that we don’t need anything to go with it. Truly splendid. In a saucepan, heat the oil over medium-heat. Add the onions, cloves, a pinch of salt and pepper powder. Reduce the heat to low, cover, and cook, stirring occasionally, until the onions are golden-brown and very soft, 20-25 minutes. Remove the lid, increase the heat to medium high, and cook the onions, stirring often, until deep caramel brown, an additional 2-3 minutes. Add the cranberries, sugar, a pinch of salt and 1/2 cup water and bring to simmer over medium-high heat. Simmer for 1 minute, then cover, turn off heat, and let cool to room temperature. You could half the ingredients and make this sauce, which will be good for 2 people. The sauce may be prepared up to 3 days ahead and refrigerated. Return to room temperature before serving. 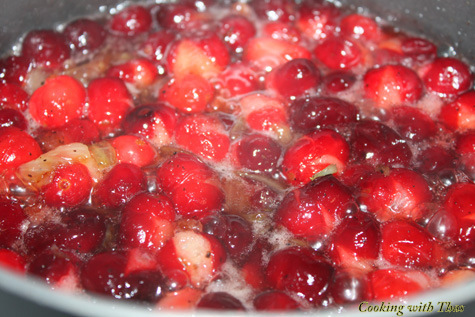 Add the cranberries, sugar, a pinch of salt and ½ cup water and bring to simmer over medium-high heat.